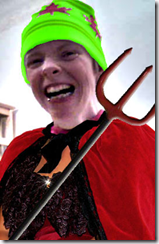 Is your blog including everyone you thought it was? You want to include everyone by making your information accessible. You want to create a level playing field. You even know web accessibility is good for search engine optimization (SEO). But you are overwhelmed. You are too busy. You don’t know where to start. I get that. If you want to know exactly what changes you need to implement on your site to include everyone within your niche – regardless of disability – I can show you. Blog Accessibility is So Overwhelming! Where Do I Even Start? Great question! All of these accessibility requirements can be overwhelming. And, blog accessibility can be more cumbersome than web accessibility because of the four parties involved in each blog. However, each individual blogger can still do much to increase accessibility of their blog. Start with the area you have the most control over: the post – the piece that you write regularly. Incorporate the Accessibility Checklist for Blog Posts into your post writing process and you will be off to a strong start in making your blog accessible. You know the sites: the kind where clicking on a link opens a new window (or a tab, depending upon your browser). The back button doesn’t take you back to the previous page because a new window opened instead. By the time you are finished with the site, you have several windows open that you must now close before carrying on with whatever you were doing. How annoying. Why is Opening Links in New Windows an Accessibility Sin? Besides being a frustrating user experience, suddenly opening new windows can disorientate or be missed completely by some people. I recently heard a senior new to the internet claim a link was not working because nothing happened when he had repeatedly clicked on it. He had not noticed that the link opened in a new window and that he now had 15-20 windows open. For those with limited hand function or vision impairments, dealing with new windows opening unexpectedly require extra effort to close and to navigate back to the original window. How to Absolve this Sin? Allow your blog readers to control whether or not a link opens in a new window. You achieve this by not setting the target of the link. 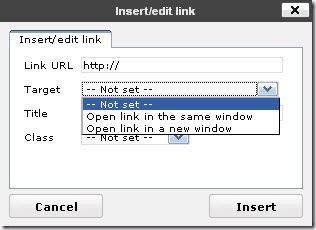 In WordPress, this means choosing the “not set” option for Target when inserting or editing a link. For those familiar with HTML, this means not using the target attribute. Have questions? Ask in the comment section below. For more tips and tricks in creating accessible blogs and content, check out the Blog Accessibility Mastermind. Font Resizing Widgets: A Help or A Hindrance to Accessibility? A font resizing widget enables your blog readers to easily increase the font size to suit their comfort level for reading. It seems like a handy tool to make available to readers to increase accessibility. However, as is often the case with features that appear, at first glance, to improve accessibility, there is no consensus on whether providing such a tool is actually a help or a hindrance. Proponents of this feature say it provides a quick way for people to adjust the font size when needed. The feature is ideal for individuals who do not need a full blown magnification program (e.g., aisquared’s ZoomText) and for individuals with limited internet experience who do not know how to change the font size settings within their browser. The feature also assists individuals with cognitive impairments who do not have the skills to adjust their browser settings or who are locked out of their browser settings. Proponents of this feature say it adds more clutter to the site, particularly for keyboard users who then must tab through more content to reach the content they want. They claim that adding such a feature benefits a select few while negatively impacting the experience of many. They offer that it is better to educate readers on how to change standard browser settings. In his post Web Accessibility Preferences Are For Sissies?, which discusses the disadvantages in greater depth, Jared Smith points out, "There may be places where accessibility preferences, widgets, or controls are justified. My point is that they always come at a very steep cost – and that developers should balance the possible advantages of web accessibility preferences with the significant disadvantages." Do you provide a font resizing widget on your blog? Would it depend upon your targeted audience of your blog? Do you wish more or fewer bloggers included such a feature? Share your thoughts in the comments below. 23 Comments - Leave a comment! Captioning videos is an accessibility must for individuals who are Deaf or hard of hearing. Captions also benefit those who do not understand the speaker’s accent (we all have accents! ), and those who do not have sound available while watching the video. 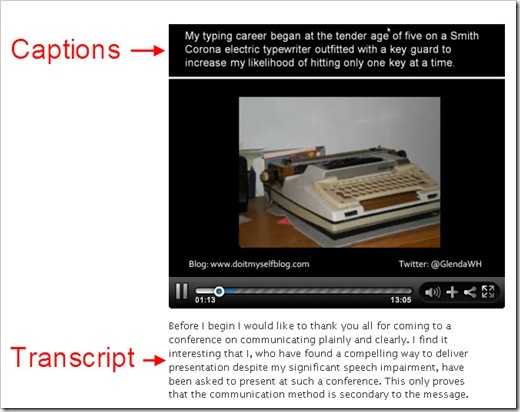 Providing a transcript – a textual version of the video – further increases accessibility of the content. People who are deaf-blind can access the content by using a refreshable (dynamic) Braille display, which converts text into Braille. The text is then searchable by search engines. People can double-check a point without watching the video again. Some people prefer reading rather than watching a video; others prefer both. Content is still available when the video is not; for example, a Flash video can not be viewed on a iPad. What other benefits are there to providing video transcripts? Share your thoughts in the comment section below. Are you a blogger, web designer or a business wanting to increase your web traffic and readership by creating sites accessible to people with disabilities – an under tapped market with more than twice the spending power of American teenagers and almost 18 times the spending power of the American “tweens” market? Are you attending the South by Southwest (SXSW) Conference? How is the iPad life-changing for many people with disabilities? What is the size of the disability market and its spending power? What are the barriers people with disabilities face online? What are the four guiding principles to creating accessible websites and blogs? Where do you start in making your website or blog accessible? I’m really excited about this session. It should be a good, jam-packed one. Please come up and introduce yourself. No need to be shy! If you are not attending SXSW, you can follow along on Sunday with the hashtag #POURsite on Twitter. Every industry, business and organization has them. They are well understood and simplify communication “In-house”. Yet, for outsiders, they cause confusion. They are acronyms: the alphabet soup that insiders understand but exclude outsiders. Why is Not Expanding Acronyms an Accessibility Sin? In this sentence, what does ADA mean? Is the acronym referring to the American Dental Association, the American Diabetes Association, the Americans with Disabilities Act or something else? Without knowing what ADA stands for, this sentence is rather vague and meaningless. Although this example may be considered staged to demonstrate a point, coming across unfamiliar acronyms (and jargon) in blog posts can be jarring and confusing. Readers may not completely understand the remaining content and may feel excluded. Content filled with too many unexplained acronyms may frustrated readers, causing them to click away. A key point to remember is that, even though you may have expanded the acronym in previous posts, readers may enter your blog on any post, making it necessary to expand every acronym the first time it is used in each post. Web and blog accessibility is more than checking off a seemingly long list of technical requirements, possibly to avoid legal action. Web and blog accessibility is about people. It’s about enabling people with all kinds of abilities and disabilities, using a variety of technologies, to use websites and blogs. It’s about enabling people to use sites independent of assistance from others. It’s about freedom. It’s about empowerment. For blog and web developers to see accessibility as more than a checklist of technical requirements, it is beneficial to hear from people with a wide range of abilities and disabilities who use various technologies to access the Internet, to hear about the obstacles they face online, and to hear ideas and feedback for potential solutions. With this sharing of personal experiences, then real understanding for the need of accessible sites and blogs can begin to happen. 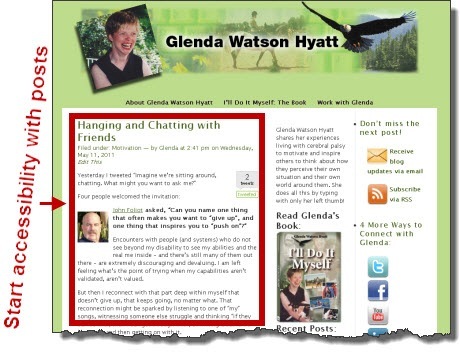 From there, a collaboration between bloggers or web developers and the readers or end-users can take place. To that end, I’d like to invite people of all abilities to share your stories of surfing the internet. What works for you? What drivers you nuts? What do you wish bloggers and web developers would do differently or would understand? I would like to invite you to share your personal experiences in either a guest post or in question-and-answer post. Ideally, I would like to share a couple of stories per month. If you’re interested in sharing your story, please leave your name and your preferred format in the comments below and I’ll be in touch to arrange a date for your time in the spotlight. Let the story sharing and collaboration begin! Neuroplasticity: What If Brain Damage Need Not Be Permanent?